It’s almost the end of the year and Infinix has released yet another flagship, the Infinix Zero 3 (X552) tagged #Hero3Logy. A while ago, the Infinix team launched the Infinix Note 2 labeled #TheNextHero, and we thought it was all for the year not until the #Hero3Logy broke off its shell. This device as of this time surpasses all other devices made by the Infinx team, ranging from the camera quality (20.7MP) rear camera, 5MP front camera, 3GB of RAM, fast 2.2GHz Octa-core processor, and lots more. No doubt, this device will surely be the talk of the mobile market. Of course, the Infinix Zero 3 is a successor to the Infinix Zero 2 device. I think it’s good we see what more this device possesses, let’s move on to the specifications. The Infinix Zero 3 comes with a 5.5 inches display size which is no way to be compared with its predecessors – Zero & Zero 2 (5.0 inches display). Movie and game lovers are not left out as this device ensures clarity at its best when looking at photos, watching movies and playing HD games, it’s made from Corning gorilla glass 3 screen that displays on 4K resolution, 400ppi 1080P with a real wide angle up to 178°. The classic and premium body-design of the Zero 3 is something to talk of as it comes with a dual-sided explosion-proof glass and stainless steel frame. At the front, you’ll find a glossy piano paint while the back features meticulously brushed metal. Zero 3 comes in 3 beautiful colors: Black, Gold and Silver/Grey. Zero 3 runs on the Android Lollipop 5.1 OS platform, with a fully customized user interface by the company’s own UI known as XUI. Game and multi-task lovers will go for this device as it’s packed to run via the latest and fastest MediaTek (MTK) Chipset (Helio X10 Octa-core processor), this is usually found on latest high-end smartphones and also runs with a 2.20GHz CPU having 64bits. Zero 3 comes with a 3GB RAM and a rumored internal memory of 16GB / 32GB ROM variants, with this you can store a lot of files. This device supports 2G: GPRS – up to 32 to 48 kbps; EDGE – up to 236.8 kbps, it also supports 3G: Up to 21.2 Mbps downlink; Up to 5.76 Mbps uplink, Unlike Infinix Zero, the Zero 3 supports the 4G Network to it’s not rear in Nigeria. Zero 3 also supports WiFi: Wi-Fi 802.11 b/g/n, Wi-Fi hotspot, DLNA, Wi-Fi Direct and Bluetooth: Version 4.0, A2DP, LE. this is indeed a smartphone. Zero 3 camera beats all other Infinix phone cameras, as it comes with a 20.7MP rear camera, this was manufactured from SONY IMX230 CMOS sensor, Zero 3 camera is combined with a 6P Largan lens to retain vivid details even when enlarging or cropping. Beside the back camera is a double LED flashlight to make capturing photos or videos clearer in the dark or night hours and the cameras are powered by Four-lane MIPI that gives a 30fps 4K display clarity on the recording. 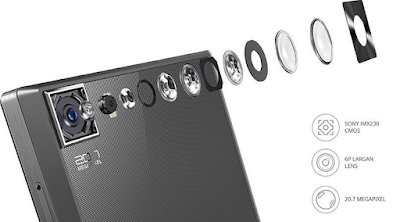 This device has a 5MP front Camera, it sure will serve you for selfies and video calls. The Zero3 smartphone battery has a capacity of 3030mAh which is almost double that of the Infinix Zero and much more than the Zero 2. one good thing about this battery is the ability to charge fast, and can be used unto 24 hours while using the internet usage and lasts more without internet usage. I have to say about this device is that it lacks some features, I think if where in place would have made it super, like talking about the connectivity, it lacks a 4G on the base model, it has no finger scanner, and the battery capacity is not too suitable for it, but it has a classic camera. I am of the opinion that Infinix only paid more attention to the camera of this device and a little upgrade on the battery.